Back in January I wrote about the IF campaign. Like the Make Poverty History initiative that gave Gerry the Voice the big idea to make Pier32 all ethical all the time, IF uses people power to send a simple message to the people in power. The simple fact is that world hunger is a logistical problem. There's plenty of food for everyone, if we take a few steps to change the way we source, harvest and distribute it--and if governments around the world do their bit to be open, transparent and fair about how it's happening. The focus of the campaign is the G8 summit, held in London in June, with a huge event, The Big IF, in Hyde Park on June 8th. With just over a week to go, now's the time to show your support for a simple and powerful message. Together, we can make sure that world leaders hear us. Tell it like it is, David Beckham. My last post talked about how it's a bad idea to boycott or force companies out of Bangladesh, at a time when their money is most needed. However, this doesn't mean that we can't apply a little consumer power in the right places to make sure our favourite brands are doing right by their responsibilities. Knowledge is strength, and it's good to know who's upfront, and who's backtracking. Many UK-familiar High Street names like Primark and Tesco have already signed the Bangladesh Fire Safety Agreement, a comprehensive workplace safety measure which, if properly implemented, could change the face of fashion manufacturing in the Far East and Asia. In the States, it's a different matter. Only two major retailers, Abercrombie & Fitch (which shows the other side of the douchebaggery I highlighted last week) and PvH, home of Calvin Klein and Tommy Hilfiger, have signed the accord. There are a lot of big name holdouts that could still torpedo the BFSA before it gets out of the dock. So who are the companies that are trying to wriggle out of signing? The biggest names on the list (published this week by Ecouterre) are Gap and Walmart, who run the Asda brand in the UK. Gap, in particular, are striking a low blow by claiming that they're happy to sign with just one minor change to the agreement. That change being the removal of the clause making it legally binding. Which, let's be honest, removes the point of the whole thing. It's interesting to note some obscure names on the list with some heavy High Street punch. VF Corp, for example, probably doesn't mean much to you. But they own high-profile outdoor brands like Timberland and The North Face. And they're still using factories that have the potential to collapse in the same way that the Rana Plaza did. Inspectors from Walmart and Inditex (owners of Zara) have found cracks in the walls of a factory near Dhaka, which caused it to fail safety audits. VF Corp see no problems with continuing to use this factory, saying only in a statement that it was" in daily contact with the facility and VF's leadership is closely monitoring the status in this facility and others in our Bangladesh supply chain." It's important to keep track of what the big High Street and retail park brands are doing out in places like Bangladesh. They're counting on their Western customer base forgetting about the Rana Plaza, and about the promises of help and support. Let's show brands like Gap and faceless conglomerates like VF Corp that we can't forget, and that change in the death-trap factories that they run across Asia and the Far East is long over-due. Multinational companies faced with the inevitable blowback from their involvement in the Rana Plaza disaster could be forgiven for considering retreat to be the safest course of action. Getting out of Bangladesh makes all kinds of sense. Let's face it. The old saw of "all publicity is good publicity" simply doesn't apply here. If your labels have been found in the rubble, then you need to act quickly to avert the inevitable damage to your carefully-considered brand. The smart option would seem to be to jump ship and move on. Disney have already announced that their clothes and toys will no longer be sourced from factories in Dhaka. The EU are thinking about punitive trade measures to force Bangladesh on line with international heath and safety standards. In that sort of toxic environment, and with your own customers boycotting you, wouldn't you think the best option would be to pack up shop and leave? But leaving Bangladesh is the worst thing that the multinationals could do now. Their business is the lynchpin of the country's economy, bringing in billions that Bangladesh can ill afford to lose. When you consider that 3.6 million Bangladeshi workers are employed in the garment industry, 80% of which are women who are the sole source of income for their families, the notion of Mango, Primark and the like leaving the country becomes a double blow. Workers have been maltreated for decades as the multinationals quietly allowed worker abuse and poor workplace safety to become the norm. When the companies were found out, all of a sudden they're packing up to leave leave, taking the money, the one reason that anyone would put up with a 12-hour working day in a sweltering factory, away with them. A lousy job is still a job, and if that's all you can get, then having it evaporate on you is a weight on top of the burden you already carry. The notion of leaving suddenly looks petulant, cowardly and cruel. Like it or not, the garment industry in Bangladesh is helping to pull this desperately poor country out of the mire of extreme poverty. It's becoming increasingly urbanised, as rural workers move to the cities in search of a better life. Many, sick of scratching out an existance from the soil, dream of a life as a garment worker. It just goes to show how little we know about life in Bangladesh, and how our calls for boycott, made with the best of intentions, can have potentially disasterous consequences. So what can we do? Well, we need to tell our High Street shops to make sure that their workers are safely and fairly treated, wherever they are in the world. Insist that they join the growing rollcall of signatories to the Bangladesh Fire Safety Agreement. And make sure we know that they're going to be around to help clean up the mess they helped create. If that means an extra 5p on a t-shirt, then so be it. It's about time we all realised just what the true cost of fast fashion is, and how little it takes to make a real difference to lives which are more closely tied to ours than we might have thought. In the UK we are perhaps fortunate that Abercrombie & Fitch are a little-known brand. They have a certain noteriety as that shop that employs models to stand outside its flagship Mayfair store and lure in the unwary. Their diffusion Hollister brand is becoming more of a feature in our shopping malls--the stores are dark and loud, perhaps to make it more difficult to see their inflated price tags and kick up a fuss. In the States, however, A&F are everywhere, and not for the right reasons. They have a highly skewed perception of the market at which they aim: in short, they have a "no fatties" rule. I'm not kidding. They only stock jeans to a 34" waist, a policy explicitly implimented and defended by CEO Mike Jeffries. Hoo boy. Now, there's nothing wrong with quality control, or wishing to attract a certain level of customer. But A&F seem to enjoy rubbing people up the wrong way. It's as if they've seen the growing trend of conscious, socially-responsible clothes stores and thought, "Nope, that's not the image we want to portray at all. We want to be callous douchebags." This blatantly uncaring attitude is primed to backfire, and the guy to do it is film-maker Greg Karber. He scours goodwill and charity stores for A&F branded clothing (say what you like about the PR, but the clothes are well-made) and gives them to the homeless in East LA, home (if that's the right word) to one of the largest transient populations in the US. His goal? To make Abercrombie & Fitch "the world's number one brand of homeless apparel." He urges us to dig out any A&F clothing, donate them to shelters, and share the result on social media using the hashtag #FitchTheHomeless. Personally, I wouldn't be seen dead in a A&F or Hollister, but I applaud this delightful piece of direct action. Check out the video before to find out more. You're a good person. You must be. You read this blog. Because you're a good person, you reuse, retask and recycle. If there are clothes in your wardrobe that you no longer need, then you take them down to the local clothes bank or charity shop. Then you leave them there, warm in the knowledge that your old band t-shirt will be warming the back of a kid in Africa, helping them out and spreading the word about Ned's Atomic Dustbin at the same time. That's not necessarily the case, though. In a fascinating article for NPR, journalist Jackie Northam has followed the story of what happens to donated clothing. If you have dreams of that Ned's t-shirt going to the Congo, then be prepared for a let-down. 80 per cent of clothes donated to local charities will be picked up by recycling companies--your local Oxfam simply doesn't have the room to store the billions of pounds of clothing that floods in each year. That clothing is then graded, sorted and packed for export and reuse. At least half of that thick bale of cloth is destined for humble use: cleaning cloths for industrial use, or broken down into fibre for insulation and stuffing. Which is the most likely use for your tatty old Ned's t-shirt, despite the history and sweat of a hundred gigs soaked into every thread. For clothes to be resold as clothes, they have to be of good quality. Which means that for the sort of items coming out of the cheap fashion factories of Bangladesh, there's simply no market. Would you buy a second-hand pair of Primark leggings? There, you see the problem. There's a reason that vintage clothing is so prized--it's made to last in a way that most fast fashion isn't designed to contend with. Even with all this goodwill, and the encouraging sign that clothes recycling has become big business, there's still a long way to go. It's estimated that 85% of clothing bought this year will end up in landfill. That's a criminal waste of resources. Maybe you can hang onto that Ned's shirt a little while longer. If it's destined to be turned into wiping cloths anyway, perhaps you could use it as a duster. A sweat-crusted duster full of rock memories. On second thoughts, get that revolting thing out of here. An Everyday Carry post is the very definition of a look-at-me article. It's a simple notion: you post a picture of and talk about the items that you carry with you every day. The idea is that your belongings give an insight as to who you are. There's obviously an egotistical element here, and normally I wouldn't consider The View as a place for an EDC post. But I have my reasons, as I hope you'll see. I remain a writer without a definitive writing space. Over the past few years, I've trained myself to be able to write pretty much anywhere--as an example, this piece is being written in a hospital waiting room while I hang around for test results. In order to do that, I've developed a fairly pared down set of tools that allow me to set up shop wherever there's seat space. The heart of the set up is my iPad, teamed with a Logitech Extrathin bluetooth keyboard. The two lock together magnetically, turning the tablet into a mini-laptop. Using stripped-down writing tools like Blogsy (for the blog, natch) and Daedalus, I can concentrate on wordcount without worrying about formatting. The battery on the iPad is good enough that I can write all day without needing a recharge. With all the benefits of wi-fi, I can and have posted for The View on trains, in cafes and pubs and even in the back seat of Guru Ian's car. For those times when I just need a little time away from the world, I plug in my Sennheiser CX300 noise-cancelling headphones and listen to a podcast or some music. There's nothing to them. They tuck into a tiny little snap-top pouch, and sound great. Like all my EDC, they're compact, discreet and eminently capable. As a literaddict, my Kindle is never far away. It's not the newest or fanciest, but it does the job of an e-reader without fuss, and the battery life is brilliant. Other e-readers are available, of course, but until this one breaks there's no reason to change. I always try to carry a notebook and writing implements. Sometimes it's just easier to scribble something down, or make a quick sketch. Field Notes notebooks are card-backed, small and stylish enough to go in the bag, although I'll never say no to a Moleskine. Along with that goes a Faber-Castell propelling pencil, a couple of Sharpies and a Bamboo stylus for the iPad. Apart from keys (keyring from the Rijksmuseum in Amsterdam featuring Van Gogh's Skull With A Cigarette cos it's arty and rock n roll all at once, and a wee penknife/scissor combo from Leatherman which has got me out of trouble more times than I care to mention (not that sort of trouble)) and phone (iPhone 4, two and a half years old, well overdue for an upgrade hint hint) that's about it. Apart from the bag I carry the whole shebang around in--and finally we reach the point where things get Pier32. 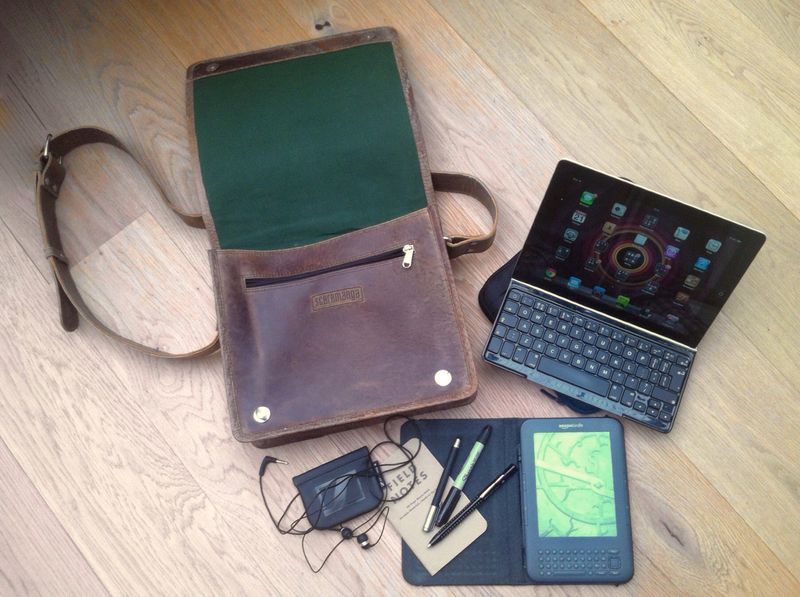 Everything goes neatly into a Scaramanga Small Messenger Bag. Made from solid and ethically sourced leather, and built to last for a lifetime, this is the tote I've been after since I started working at The Pier. The leather is going to scuff up and soften beautifully over time. I want it to show that it's used with love; much like its owner. Fasteners, importantly, are zips and mag closures--no nasty velcro for me, thank you. The build is incredibly sturdy, and finished with craft and care. With enough pockets and compartments to keep everything organised, it was delivered in a sweet little cloth bag that I've started using as an emergency shoppping bag. The Scaramanga was, if I'm honest, a bit on the pricy side, but then let's not forget the ethical mantra. Spend more, buy less, choose well. Frankly, my friends, I think I've chosen very well indeed. So, that's my Everyday Carry, and that's more than enough from me today. I'd love to know what's in your daily go-kit. Feel free to share in the comments. 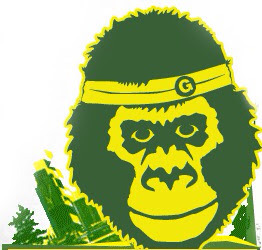 Go Ape With The Great Gorilla Run! It might seem a bit overenthusiastic to talk about an event happening in September when it's only mid-May. But let's face it. It only seems like a couple of weeks since Christmas, and this stuff has a tendency to sneak up on us. So, as it's Client Friday on The View, it's my duty to give you a decently timed heads-up about one of the great charity events of the year. The details. Registration is 80 quid, and the Gorilla Organisation ask that you raise £400 in sponsorship. The suit is free, and it's yours to keep to help your fundraising, and to wear down the pub afterwards. I knew my wardrobe was missing something. "the most fun event for conservation going on anywhere in the world." “seeing hundreds of people dressed as gorillas, with fancy dress on top, is one of the most wonderful sights you will see in London. I would recommend it to everyone”. I have to agree with that. It sounds like a blast. My recommendation, therefore, is to get yourself over to the website and sign up sharpish. *yes, I know gorillas aren't monkeys. But I've already made one ape joke in this post already. If you've wondered how many people have to die before retailers sign up to a comprehensive safety agreement, you have your answer. Over a thousand corpses have been pulled out of the collapsed Rana Plaza building in the Bangladeshi capital, Dhaka, and the rescue effort has finally been called off. Out of tragedy, there is a sign of hope. Big high street names like Primark, H&M, Marks and Spencer and Tesco have all signed the landmark Bangladesh Fire and Safety Agreement, a document specifically designed to protect workers from the kind of dangerous working conditions that led to last month's tragic events. This is an enormous step forward, signalling the possible start of a new era of co-operation between unions, factory owners and their big Western clients. However, it isn't all good news. Some retailers have refused to sign the deal, angling for better terms and stronger negociating positions should things go wrong. Notable holdouts include American retail giant Walmart (never, it has to be said, the friendliest of companies when it comes to worker/management relations) and Gap. Gap were not linked to the companies in the Rana Plaza building, but they do have a significant presence in the country's fashion industry, putting work through nearly 80 factories. They have offered amendments to the agreement, citing concerns over the way disputes are settled in court. That amendment would pull most of the teeth out of the BFSA, rendering it a voluntary agreement with little government oversight. "It's a straightforward statement that they don't care at all about the safety of their workers and aren't interested in taking action to put that right." "unacceptable some of the biggest high street brands appear so reluctant to sign up to reforms concerning the safety of Bangladeshi workers". Gap have, in this writer's opinion, fatally misjudged the mood surrounding the Rana Plaza collapse. They're trying the same old legal tactics to wriggle away from their responsibilities in a market in which they are a major player. If they tried something like this in Europe or the States, they would be quite rightfully pulled over the coals, and there's no reason not to do the same thing over their shameful actions in Bangladesh. Expect loud boycotts and a rapid reversal of position in the next week or so. Have a Big Night In with The Big Issue! I am, it has to be said, something of a homebody. My idea of a good evening is pootling around in the kitchen making something delicious, before settling back to watch a movie with a glass (or two) of wine with my best girl by my side. For me, home is very definitely where the heart is. For thousands of people up and down the country, this is a seemingly unobtainable dream. Due to abuse or poverty, they have to spend their nights in shop doorways or one-night hostels, vulnerable to a very cruel world. Homelessness is on the rise in the UK, and it's vital that those of us lucky enough to have a roof over our heads do something to help out those that don't have that blessing. However, that doesn't mean we can't have a little fun in the process. 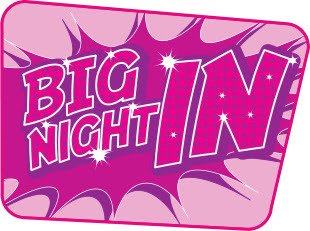 The Big Issue Foundation is launching The Big Night In this week. Imagine Come Dine With Me without the irritating fame-monsters. The idea's pretty simple. Throw a dinner party, give it a theme, and raise some cash for a very good cause. There are tons of ideas on the Big Night Out website, including recipes from celebrity chefs like Ainsley Harriott. I'm certainly going to give his chicken and chorizo bake a try--it looks delicious. For those of us who aren't really into the whole Children In Need shave-your-head-and-sit-in-a-bath-of-jelly style fundraising, The Big Night In offers a cosy and rather more civilised way to help out those who, through no fault of their own, find themselves without a place they can call home. To me, that seems like a pretty fair deal. Everyone into their Pier32 onesies and over to mine, then. I'll get the Twister board set up. Home. It's a simple word, with such a wide range of meanings. It's one of those words that instantly conjures up a different image for all of us. But the feeling that the word evokes are universal. Comfort. Security. Safety. What if that wasn't the case? For millions of people around the world, home isn't a safe place at all. It's a shack with a hole in the roof that lets in the rain. It's a ragged tarpaulin strung up between sticks. If you're a child, places like this are no good if you need to rest or study. They're worse than useless. They can actively hold you back. 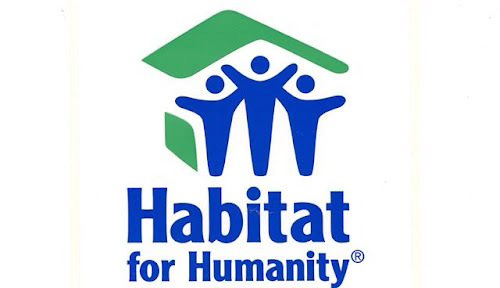 Our friends at Habitat For Humanity have always known that having a proper roof over your head is the first step to making a better life for yourself. For years they have been working with local communities across the globe, helping to build houses and homes for the most disadvantaged communities. Using cutting edge materials and processes, they can get a house up in a few weeks. Habitat For Humanity are launching a new appeal this spring, making sure that we know how precarious home life can be for millions of people, and how little it takes to give families a rock-solid foundation for the rest of their lives. Pier32 has always been delighted to support Habitat For Humanity, and we're happy to do so in 2013. This weekend, take five minutes to check out the appeal website, and see if there's something you can do to help not just build houses, but homes and futures. If you're a fan of wildlife, then it's easier than ever to make the most of your passion. With a smartphone and the right apps, you can hunt down our native butterflies, birds and insects, hook up with other nature-lovers to share what you've found and even find tasty mushrooms for a rewarding snack afterwards! Don't forget, with WWF Wildlife Mobile, as you enjoy the wildlife with the help of your smartphone app, you’ll also be contributing to nature conservation – and it won’t cost you a penny. The SIM-only mobile network from WWF promises ‘every conversation helps conservation’. And because it offers customers cheaper standard Pay As You Go rates than the other major networks, plus a range of competitive bundles of calls, texts and data – it won’t cost you any extra to help safeguard the natural world. And because you get 99.7% UK wide coverage thanks to the partnership between operator Digital Spring Mobile and Vodafone UK, you can use your apps even in the middle of nowhere--handy for the dedicated twitcher or bug-watcher. WWF Wildlife Mobile gives 10% of the net call revenues for conservation, which is ideal for the growing number of people with an interest in, or a concern for, the environment. It’s open to anyone – not just existing WWF members. Why not give it a go? For more details, check out the website. We think of the business and charity sectors as fundamentally different. But at their core, they have the same purpose; to make money for other people. For businesses, it's their shareholders. Charities are beholden to the good causes they help to support. And yet, if a charity spends more than the absolute bare minimum on staffing, admin or heaven help us investment in the future, then we're on their necks like a pack of howling dogs. For the business sector, this is essential. Without it, a venture simply won't be able to survive. Why do we feel that charities are unable to do the same? In the long run, isn't it better for the people that any given charity is trying to help to have a strong, healthy organisation that's going to be much more productive and capable of doing the very thing they were formed to do? As charities are asked to do more with less funding and fewer resources in Cameron's laughable Big Society, it's time for us to reconsider charity, and more specifically our attitude towards it. Today, rather, than waffle on at length, I want to point you in the direction of a TED talk by activist and fundraiser Dan Pallotta, which calls for just such a rethink--and more importantly, how it might be achieved. If you have any interest at all in the future of fundraising, then I urge you to set aside twenty minutes and watch this video. It might just change the world of charity for you. It's always important to be on the lookout for new innovations in fabric. After all, if we're ever going to move away from the ubiquity and toxic effects of cotton, we need to find something that can properly replace it, with the added benefits of a lighter ecological footprint. Paper No. 9 are a New York-based startup that might just have the answer--or at least part of it. They've developed a process that turns paper into a sewable, hard-wearing fabric. We're not talking about the coated paper gowns with the embarrasing gap at the back that you see in hospital. This stuff is designed to last, and crafted to be luxurious. Like many innovations, this new paper fabric has its roots in the past. More specifically, in 19th century Japan, where artisans developed kinkarakawakami, a wallpaper designed to mimic the look and feel of gilded leather. It's displayed, for example in some of the dining halls at Buckingham Palace. Paper No. 9's material is free from complex polymers, and completely natural. It can be used in a wide range of applications, from clothing to interior design, and clients are asking for new ways to use it, from stationary to bags. This stuff is incredibly versatile, and can be tweaked to suit any use. It's available in different weights, transparencies and finishes. It's water-resistant, animal and toxin-free, created without the use of bleaches or stripping agents, and with minimal waste. Sounds like a dream, right? Well, as with any dream, there's a wake-up call. The heavy artisinal focus of Paper No. 9's product range tells a story by itself. It's sold by the square foot. At the moment, they're simply too small to ramp up production to the mass market, and the product would suffer if they did. They remain exclusive, catering to a bespoke market and limited-edition production runs. There's no reason this can't change, of course. If the interest is there and the costs come down, I think there's room for Paper No. 9 in a world without cotton--a world where a mix of eco-friendly fabrics from PET to nettle to hemp are the norm. Paper No. 9 may not be the only answer to the stranglehold cotton has on the fashion industry, but it can certainly be part of the solution. For more, check out the website. The death toll continues to rise in Dhaka in Bangladesh. At the last count, over 400 people have died, and 2,500 have been injured. A May Day march through the streets of the city, traditionally a time for workers to air their grievances, has taken on a special significance and gravity this year. The owner of the collapsed Rana Plaza building, who illegally added three stories to his building after only securing permission for five, is in custody--and Bangladeshi garment workers are calling for his head. "I want the death penalty for the owner of the building. We want regular salaries, raises and absolutely we want better safety in our factories. Vengeance is one thing, but Mongidul is right. The problems of corruption, worker abuse and workplace safety are a symptom of the malaise at the heart of fast fashion production in Asia, and picking out one man, however guilty he might be, does not solve the wider problems. It's interesting to see the responses of Western retailers caught in the controversy. Primark have been open and straightforward over their role, and have offered compensation. Benetton and Mango, on the other hand, only admitted their clothing was made at the Rana Plaza after news footage emerged of their clothes amidst the rubble. Walmart and Bon Marche remain silent on the issue. More, clearly, needs to be done. The most immediately positive step forward would be for foreign manufacturers to sign up to the Bangladesh Fire And Safety Agreement, an agreement that would fundamentally reshape both construction and workplace safety in the country. The BFSA calls for independent building inspection, and work on emergency access, often either blocked by factory rubbish or barred and locked shut. The agreement would establish a chief inspector, independent of companies, trade unions and factories to execute a safety program. Audits of hazards would be made public. Corrective actions recommended by the inspector would be enforcable by law. Retailers would agree to pay factories enough so that they could afford renovations, and they would be forbidden from doing business with noncompliant facilities. The inclusion of labor representatives on the task force overseeing the agreement would build employee confidence in factory safety, as would a clause establishing that workers make up at least half the members of factory health and safety committees. All of which sounds pretty fair to me. Primark, shamefully, are dragging their heels on signing up and are working on implementing their own plan. This follows Gap, who put a self-funded fire safety plan in place following the Tazreen fire in November. The problem is that the BFSA extols independence and transparency in its reports and recommendations. Primark's plans would have none of these guarantees in place. It's vital that worker safety in Bangladesh is safeguarded by an organisation without a vested interest in keeping costs at these factories down--typically achieved by cutting back on wages, benefits and safety measures. By refusing to sign the BFSA, Primark are undoing all their hard work in compensating the victims of the Rana Plaza collapse. The payments start to look a little bit more like hush money. If we want to prevent another disaster like the one last week, then there has to be change, and it has to be clear what those changes are going to be. For the workers of Bangladesh, the notion of shady foreign interests claiming one thing and doing another behind closed doors is old news. The BFSA could blow all that wide open. The Bangladesh Fire And Safety Agreement is available to download and read in its entirety at the International Labour Rights Forum website link below.